Sunday started off early, as Allison was going to take me and Victoria to Pixar for a quick tour. Allison has a zip car, where she pays a $20 yearly fee, and then can use one of four cars for $8 an hour. As we were driving towards Emeryville, where Pixar Studios are located, I was asking about how insurance works, and paying for gas, and all that good stuff. When we were halfway over the Bay Bridge, cars in front of us flashed their brake lights, and we saw a loose tire just flopping in one of the lanes. Allison wound up slamming on the brakes and we were able to stop a few feet from the car in front of us. 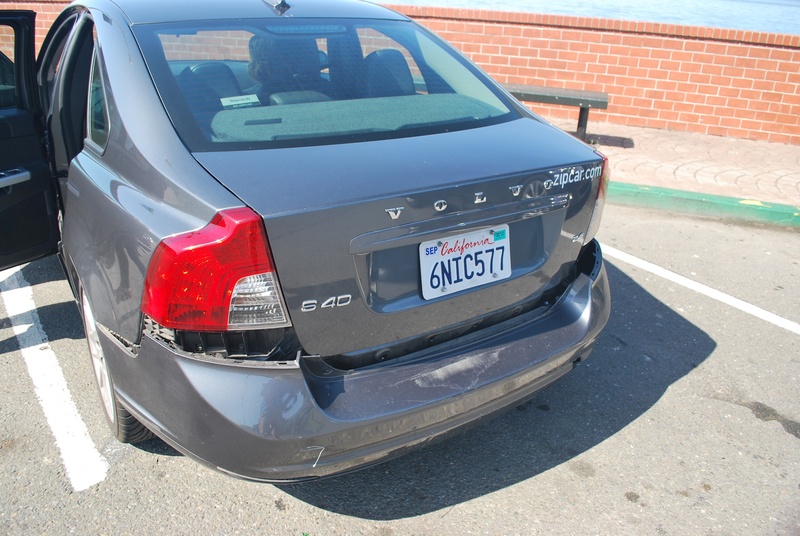 The car behind us wasn’t so lucky, and we got rear ended. The bridge was busy as usual and we took the Treasure Island exit, which is about the halfway point of the bridge. Allison pulled over and the culprits were mormon missionaries from Idaho who were in town to bless a baby. Everyone was OK, I had a little bit of a headache, and Victoria said her neck hurt a little, but overall we think we’re fine. The damage to the car wasn’t too bad, but it’s probably a hassle for the zip car company, because it takes a car out of their fleet for a little while. 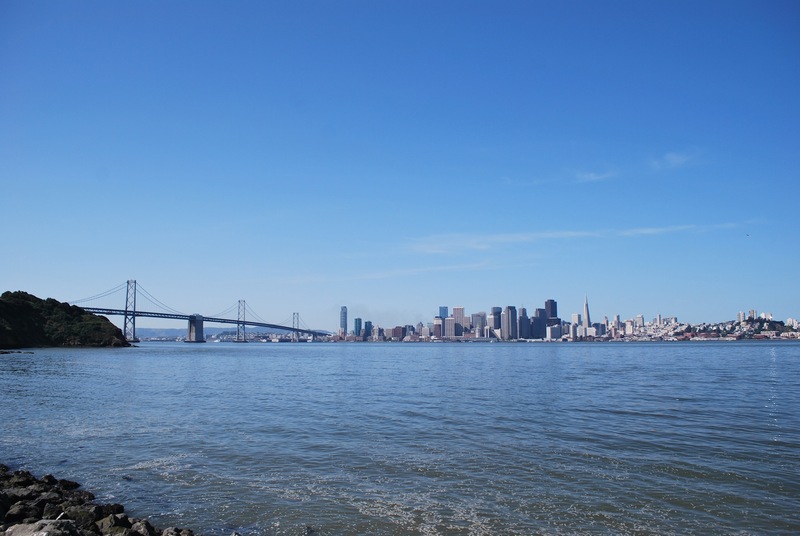 Where we pulled off presented me the opportunity to get a picture of the Bay Bridge and the San Francisco skyline (I’m always looking for the positives). We got to Pixar at around 10:15, and I was pretty excited. Going clockwise from top left, the four part picture below contains stuff that can be found outside the buildings at their campus. 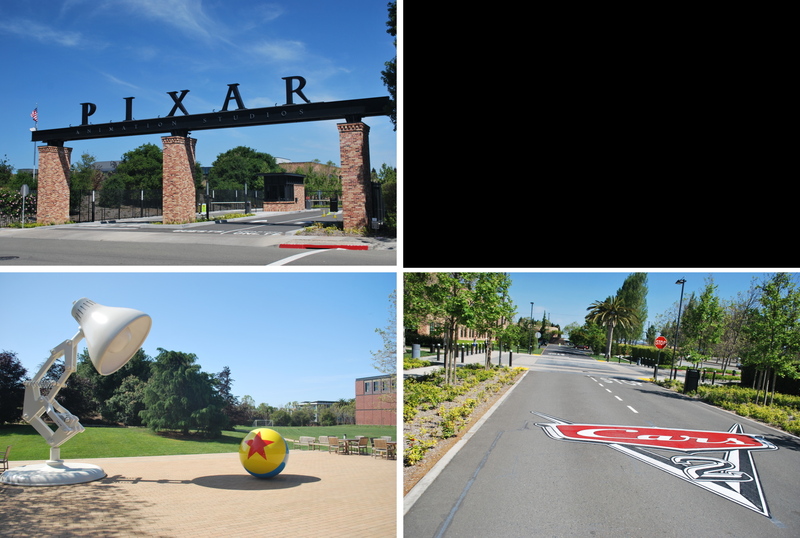 1) The entrance to Pixar Animation Studios. There is an attendant at the booth below the R in the picture. 2) Victoria and I had to show the attendant identification and we were given visitor labels. “A stranger from the outside!” is printed at the bottom. This picture is now black because Pixar was having problems with counterfeit badge issues and I was asked to remove the image. Hopefully I didn’t cause any problems. 3) The Cars 2 logo on the driveway as you get past the security checkpoint. 4) The Pixar lamp as well as the “Luxo Ball”, which has appeared in many Pixar films, including Toy Story, Monsters, Inc., The Incredibles, and Finding Nemo. 1) The cafeteria and a place for informal gatherings. 4) Pixar’s trophy case, it’s right inside the front door. There is a bunch of Oscar’s in there, and I think it contains just the best picture awards, but I’m not 100% on that. 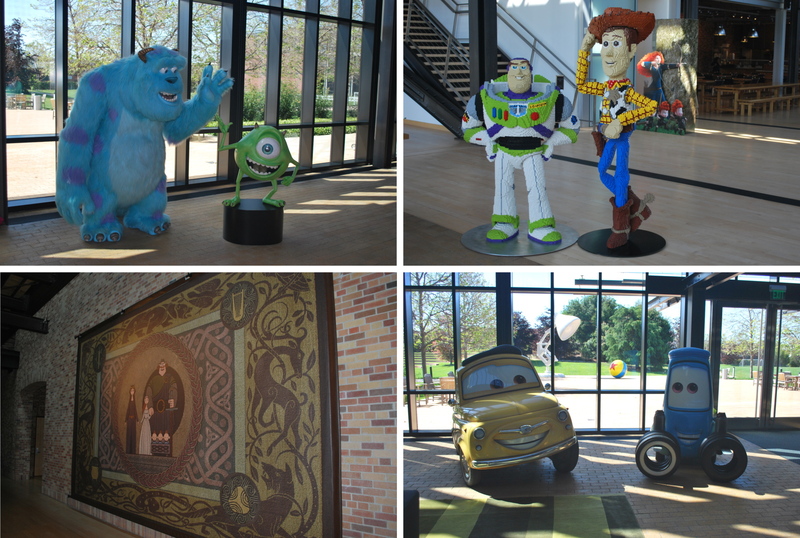 There’s a bunch of other cool stuff, but some of it I couldn’t photograph as per Pixar policy. I didn’t want to get my gracious host fired, so I reluctantly followed the rules. Again, going clockwise from top left. 1) Sulley and Mike Wazowski, the two main monster characters in Monsters, Inc.
2) Buzz Lightyear and Woody, from the Toy Story movies. 3) Two of the cars from the Cars movies. 4) A giant piece of wall art for their upcoming movie; Brave. Upstairs they had renderings and clay sculptures of the animals and characters, but I couldn’t take pictures of those. Allison showed us some other things around the campus, including one of the screen rooms, the swimming pool, basketball court, soccer field, and the on-site fitness center. It’s about what I expected from a company that has come out with amazing animated movies over the past decade, but it was still cool to see. 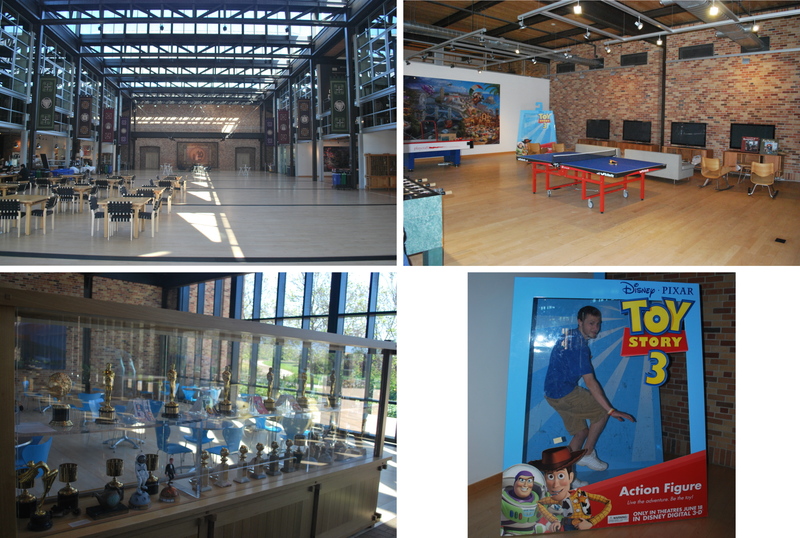 I’m a big Apple fan, and the Steve Jobs – Pixar connection is evident at their Animation Studios, seeing that he helped design the campus. Allison drove us to AT&T Park after we were done at Pixar, and we got there with plenty of time to spare. I left the two tickets that I had originally purchased at will call for Adam’s sister, because my sister’s friend Kathleen got us better seats. After doing so we circled the stadium and I took some pictures. 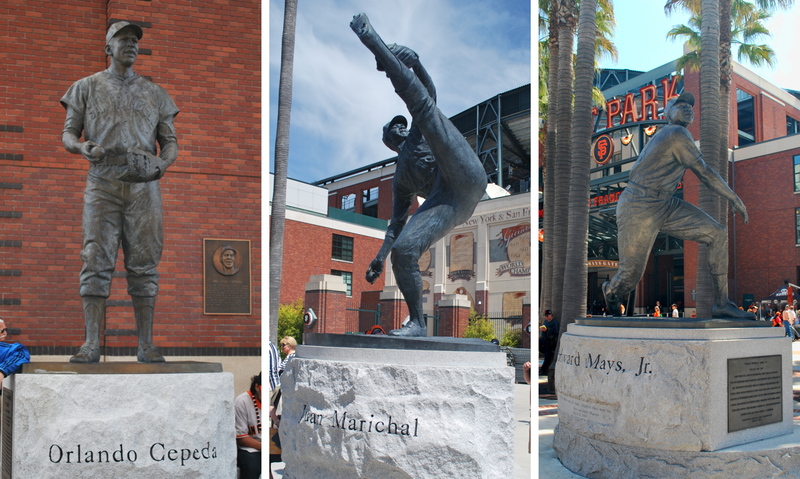 There are three statues outside of AT&T Park. There’s actually a fourth, Willie McCovey, but it’s on the other side of the cove, and I forgot to get a picture of it. From left to right you’ve got Orlando Cepeda, who played for the Giants from 1958-1966, Juan Marichal (1960-1973), and Willie Mays (’51, ’52, 1954-1972). Victoria and I walked out onto the pier that is beyond centerfield, sat out there for a bit and took in the scenery, and the great weather. When towards the end of the pier, we couldn’t help but notice some of the names of the boats that were docked. I thought these three were kind of funny. 1) The view of AT&T Park from beyond centerfield, out on the pier. 2) You may have noticed the blimp in the top right corner of picture #1. This is a close up. I’ve seen Goodyear blimps, a Snoopy blimp, and a Conan blimp, but never one that advertised Vodka. I thought it was interesting, but they did they’re job, as I had never heard of that brand before. 3) A close up of the giant Coca-Cola bottle and baseball glove from outside of the stadium. 4) One of the decorative handles for the ballpark gates. We were inside the park by 12:06, and had an hour before the game started. 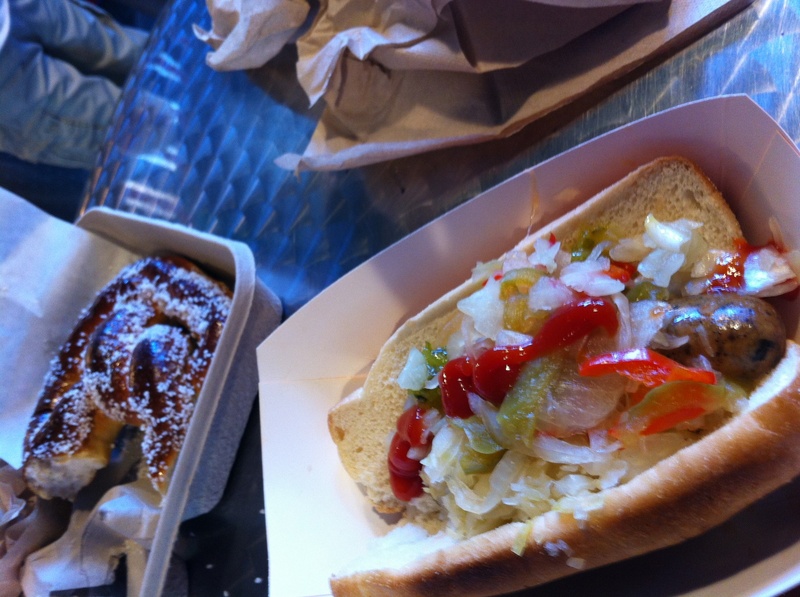 We walked around in search of something that sounded good for lunch. I figured that I should have something more healthy than a half pound polish again, and I settled on the Chicken Apple Sausage. Bad decision. It may look good below, but I just wasn’t feeling it. I don’t know if it was all the toppings combined with the unique taste that made it taste bad, but I considered not eating the rest of it. Since it had cost me $6.50, I finished it, but I wasn’t happy. Victoria had a pretzel, which is also shown below, but they put on WAY too much salt, so she brushed off a lot of it before eating. We had seen someone with lemonade, and tracked down the stand that offered it. 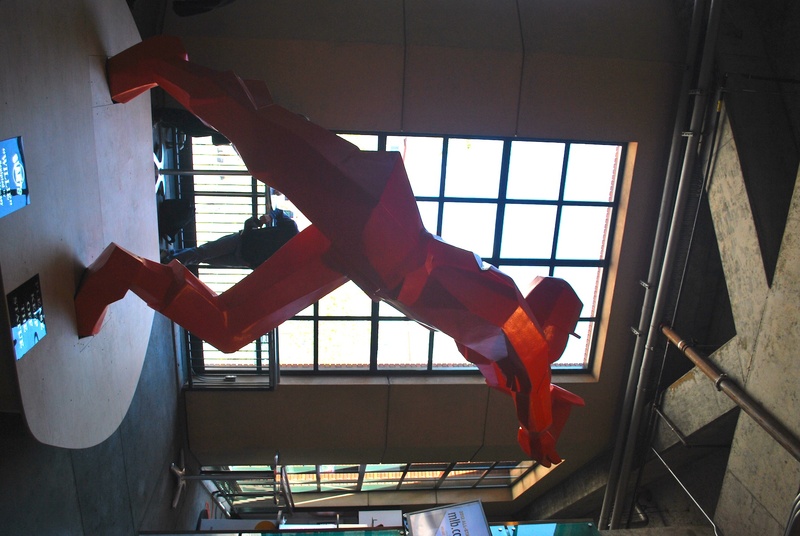 Nearby there was a cool piece of artwork that was made to honor Willie Mays and “the catch”. Willie Mays made a great over the head/shoulder catch in game one of the 1954 World Series, at the Polo Grounds in New York. Since there is video footage of the catch, it will always be available to reassure anyone who’s skeptical about how good the “Say Hey Kid” was. 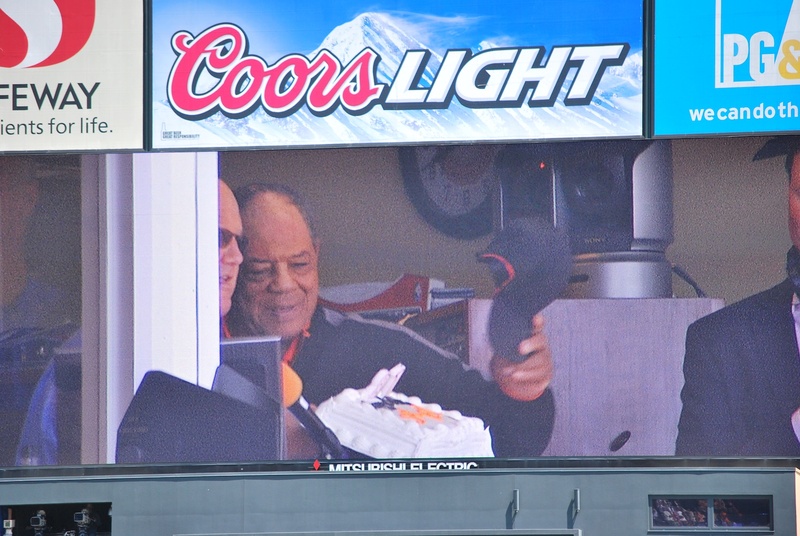 It also happened to be Willie Mays’ 81st birthday, and they celebrated by having everyone sing Happy Birthday to him. He was presented a cake in the press box, alongside Jon Miller, and they showed him on the jumbotron. It was a special moment. It was kind of weird how we got to our seats. We went down one of the aisles, and then when we got down far enough someone checked our tickets, and we went up a tunnel. In the lower level concourse, we saw the people that were going to be doing something on the field. It just didn’t seem like we were supposed to be down there. 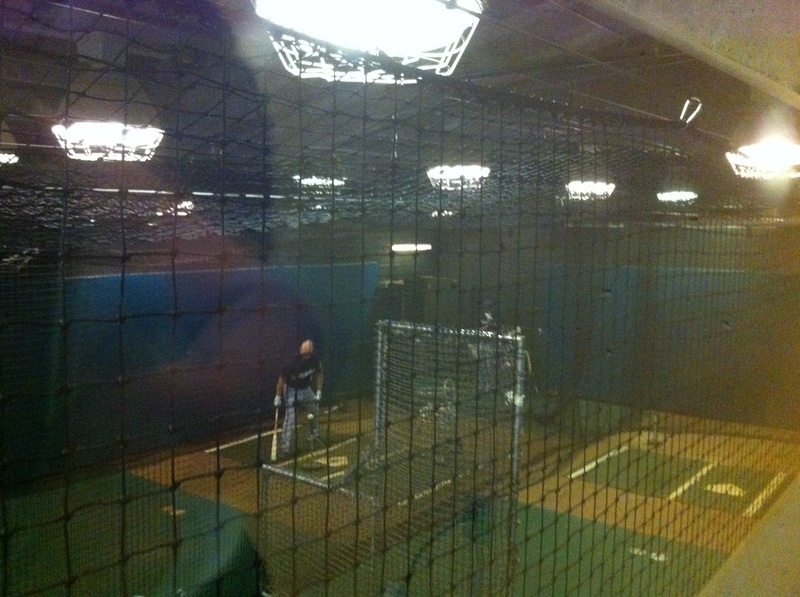 They also built this into the stadium, it’s the visiting team’s batting cages, I’m not sure if they have the same thing on the third base side for the Giants. I know the picture quality is kind of bad, despite how bright the lights look, it was kind of dim, and the windows were very reflective. Brooks Conrad was taking some hacks off of a tee. Rickie Weeks was in there as well, but I don’t think he’s visible in the below picture. After the game, we had to come back into the concourse, and I crossed paths with the Brewers General Manager Doug Melvin. We were walking in opposite directions and I patted him on the back (gently) as I walked past, and said “Hey Doug”. He quickly said Hi back and smiled. I wonder if he’s heard about my story yet, my guess is no. We also saw Bill Schroeder in the concourse right after the game, there must be a direct elevator from the press box down to that level, because he got there pretty quick. Back to the game. It got off to a good start for the Brewers, and they took a 1-0 lead after the first half inning. The Giants answered quickly and scored two in the bottom half. It was a little disheartening because I was pumped that we got a run off Matt Cain (a Cy Young candidate) so early, but then had a let down when we gave two runs right back. The Giants extended the lead to 3-1 in the fourth on a single by Ryan Theriot. The Crew was able to cut the deficit back to one after Aramis Ramirez hit a fly ball just deep enough to score Weeks. If the throw would’ve been somewhat decent, I think Weeks would have been toast at the plate. It was looking bleak for the Brewers as they entered the top of the ninth trailing 3-2. Hart reached on an error to lead off the frame, Lucroy subsequently struck out swinging, and Taylor green followed with a pop out to shortstop. Travis Ishikawa pinch hit for Cesar Izturis, and he delivered a game tying RBI double, that I thought was going to be caught. The game stayed 3-3 heading into the bottom of the 11th, that’s when the Giants got busy. Leadoff single, sacrifice bunt, intentional walk, an unintentional walk, and the Giants were in a great spot to win the game, which they did on Hector Sanchez’s RBI single. 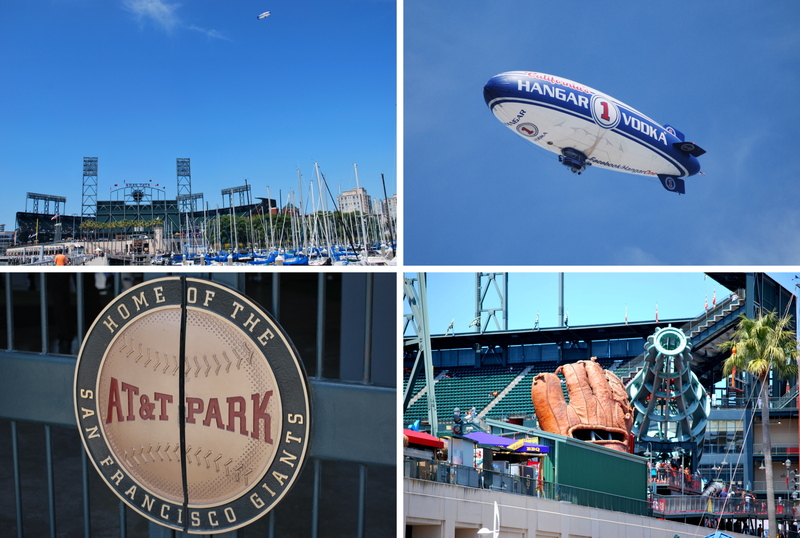 Final Score: Giants 4 – Brewers 3. This is what bugs me about baseball; basing how you use your players on a created statistic; the save. The Brewers had Tim Dillard pitching, and John Axford in the bullpen, waiting for a “save situation” (up by three runs or less in the ninth inning or later). Clearly, the bases loaded jam is more important, because if the Giants score in the 11th, there will be no 12th inning or save situation to speak of. I would’ve been in favor of bringing Axford in to try and get out of the jam, but he was left in the bullpen until the (in this case; nonexistent) save situation presented itself. That’s enough ranting. As I’m typing this, it’s 5:58 am central time, I haven’t slept in 20 hours, I’m on a plane that is somewhere between San Francisco and Chicago, and I need some sleep. 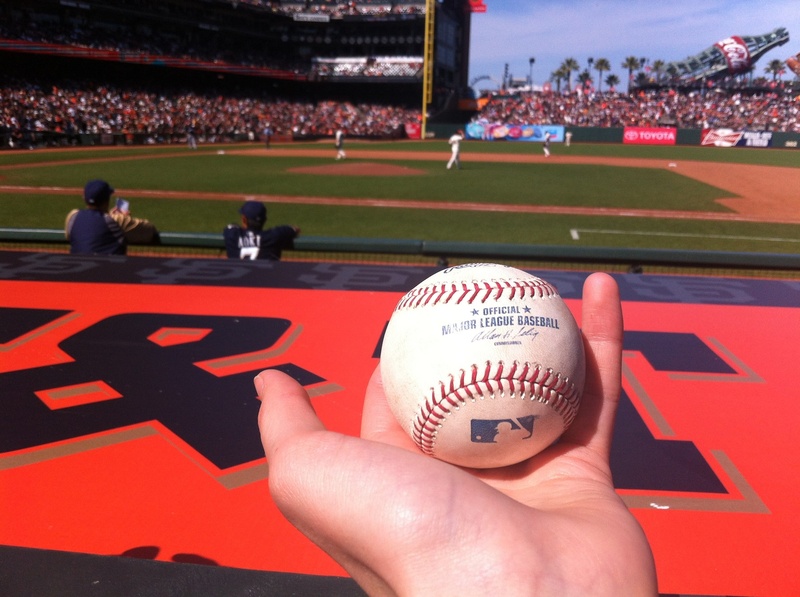 One last thing, when K-Rod struck out Nate Schierholtz to end the bottom of the ninth, Lucroy tossed me the ball as he was entering the dugout. 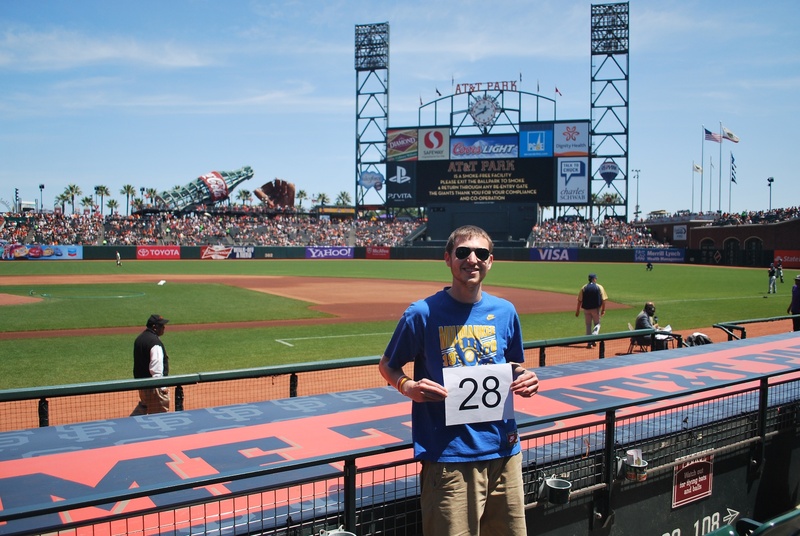 As you can see from the picture, I had first row seats, right behind the Brewers dugout! Thanks again Kathleen!!! A Brewers fan she works with, Grant, had bought four tickets off of StubHub, and then sold two of them at a reduced price, so both get props for the hookup. I also have to give a shout out to Adam and Sam, whom I met up with on Friday before the game. After we got back to Allison’s place after the game, we packed up, and took a bus over to Adam’s place, which is only a mile or so. Sam cooked us dinner (bell peppers stuffed with ground turkey, rice, and corn). They were delicious. Thanks Guys! Adam gave us a rid to the BART station, and we got to the airport at 10:00 pm, with a scheduled departure of 11:45pm. Even though I (obviously) know what happens next, I’ll leave it as a surprise for the next post. Hopefully some home cooking is just what the doctor ordered for the Brewers. They’ve got to get on a winning streak at some point if we they want to get anywhere this season.